Spoiler alert: It’s the Design Sprint with some pretty major developments that your clients/team will love. 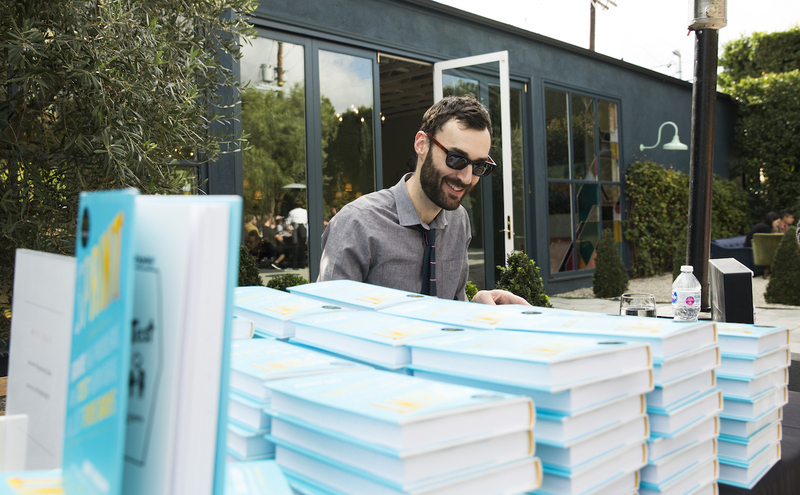 Since the Sprint book came out in 2016, we’ve run over 200 Design Sprints here at AJ&Smart. We learned a lot about what works and what could be done faster and better. On top of this, we’ve trained thousands of people with Jake Knapp—and through this we’ve found lots to little ways to improve the process and make it more efficient. With learnings from a combined 350 sprints behind us, we give you: the Design Sprint 2.0! 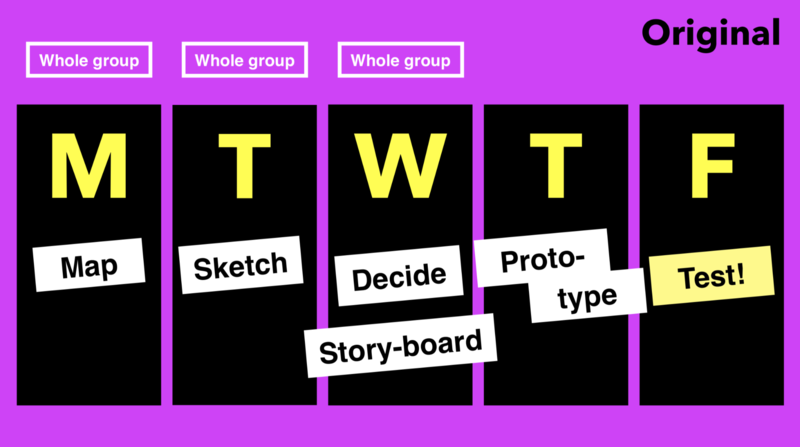 What is the Design Sprint 2.0? Design Sprint 2.0 is simply the most up-to-date, semi-official version of the Sprint, as of May 2018. We say semi-official because this is the version we teach when we train with Jake Knapp. We have created a number of videos to explain the updated process step-by-step, and we’re embarking on a series of posts to describe the changes in detail. How is it different from Sprint 1.0? 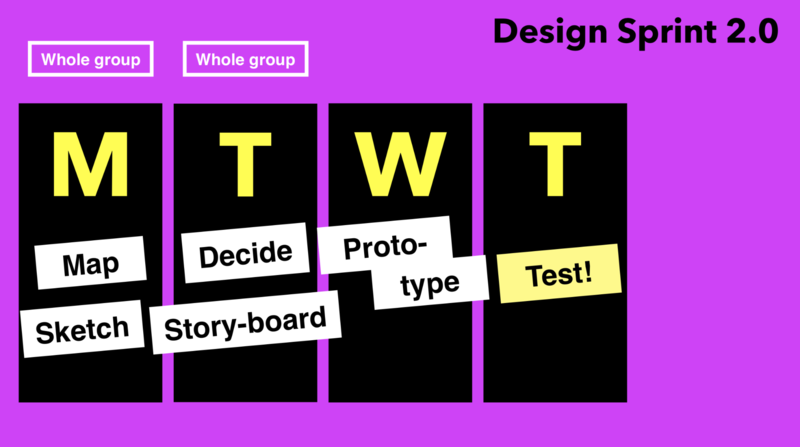 While we assume you’re familiar with the original Design Sprint, here’s a quick recap: the Design Sprint is a five-day process to solve big problems and test ideas. A dedicated team discusses a challenge, designs potential solutions, and tests them with real users. You start with something vague, and finish with real feedback and something extremely tangible in just five days. After this tantalizing glimpse, I bet you can’t wait to quench your thirst and find out exactly what’s different day by day. It goes from Monday to Friday: You map on Monday, sketch on Tuesday, decide and storyboard on Wednesday, prototype on Thursday, and test on Friday. You’ve got the experts in from Monday to Wednesday at the very least, but ideally for the whole week as you’ll need some of them on Prototyping day, and as many of them as possible on Test day. The first thing you’ll notice is that Friday is gone. It’s just… not there. ? If necessary, you can use it to do a retrospective or tie up some loose ends, but you don’t need it to invent work to fill it. How did we squeeze everything else into the remaining days, you ask? Well, two of the days are non-negotiable and non-shrinkable, so those are fixed. You guessed it: We kept prototyping (Wednesday) and testing (Thursday) intact. They take a whole day each, and they are done by the AJ&Smart team, rather than the client’s experts. The remaining two days are both split in two, with one focus area in the morning, and a different one in the afternoon. We work with the clientside Sprint team on these two days and although the schedule looks packed, we’ve been able to shorten all of the exercises to sometimes less than half the time the book suggests. In Sprint 2.0, Monday is basically two days squeezed into one. We do all of Monday’s exercises in the morning and Tuesday’s exercises in the afternoon. We find it makes more sense and works much more efficiently this way, while also keeping the momentum and the energy levels high. We mix things up a bit by starting with the expert interviews and “How Might We” questions. While that’s not what the book recommends, we found that this order helps us dive deep into the problem and ask better questions, with a better understanding of the situation. Armed with this knowledge, we then move on to defining the long-term goal and capturing the Sprint questions. Doing it this way, the progression feels more natural, and what we learned in the interviews often feeds into the sprint goal. We start with the Lightning Demos (which would take place on Tuesday morning) and spend less time looking up inspiring solutions than the book suggests. #Timehack! 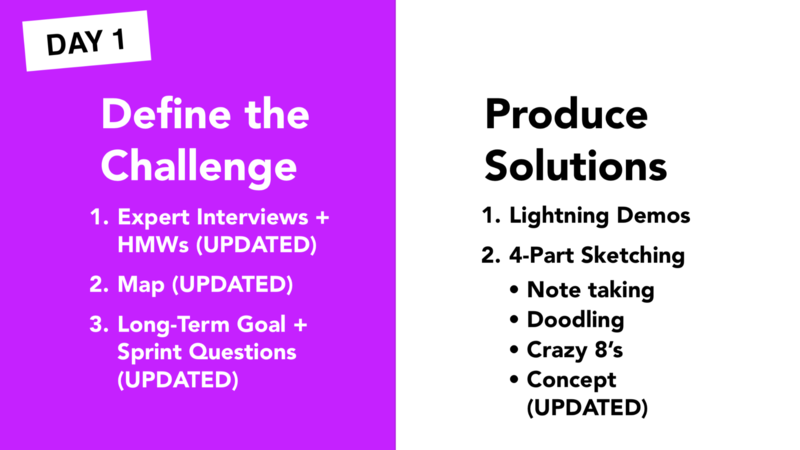 Once we’ve captured the standout ideas from the Lightning Demos, we move straight on to the four-part sketches, which we condensed, again, to keep the momentum going. There’s still plenty of time to comfortably design up the solutions and stick them on the wall for the next morning. That’s Monday done—all your knowledge pooled, your target set, your concept sketches done. Phew, now it’s time to go home and sleep. Tomorrow’s a big day. This day isn’t all that different from Wednesday of the Sprint book, so skip to the afternoon if you wanna see what’s new. Ah, Tuesday morning. A leisurely stroll around the gallery of concept sketches, coffee cup in hand, taking it all in. We spend the whole morning deciding what to prototype, starting with the Heat Map, where people place multiple votes on inspiring parts of sketches so that clusters can form. These clusters are then highlighted in the solution presentations, where the moderator walks the room through each individual sketch, followed by the straw poll (where everybody puts one vote on the one solution they want to push forward). The morning is rounded off with the Decider’s vote, where they pick one or two concepts that they want to prototype. We added a new exercise here that makes the storyboarding process at least 27 times easier (give or take). It’s called User Test Flow and it’s a form of Note & Vote exercise. 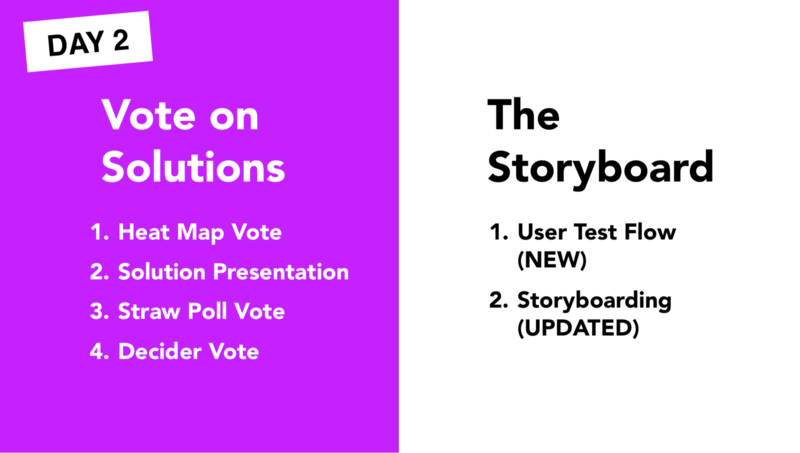 Everyone designs the barebones of their own storyboard and then we vote on the one or two that we end up prototyping. Even though it’s an extra step, it speeds up the storyboarding process by a million miles and eliminates the “designing by committee” aspect of it. Here’s a video that explains it in detail (and there’s a Medium post on it, too). So by the end of Tuesday, all of the decision-making is done, and your experts can retire and pick up their day jobs again. You’ve got a clear direction and can move on to prototyping and testing what they asked you to. We can’t stress enough what a massive win this is. It’s a low-commitment version of the old Sprint concept, but the output is just as polished (if not more) and it has won many reluctant clients over. Day 3 sees us kick off prototyping, and we do this pretty much exactly as stated in the book, so nothing new to report here. It’s noise-cancelling-headphones-on mode for our resident Prototyper, and we’ll have a couple of huddles throughout the day to make sure we’re all on track. We’ll also update the client at the end of the day to keep them involved and show them what we’ve been doing throughout the day. Day 4 is user testing day. Again, we do this pretty much by-the-book and the only difference is that we’re doing this on the Thursday rather than the Friday. And just like that it’s Friday and the Sprint is over, the client has the wrap-up report and hi-fidelity prototype, and everyone is happy. We’d use the Sprint Friday to have a retrospective of the week, have a team lunch, do some reading/learning, and generally let the past week sink in. Phew. Let us know if you plan on trying it out! If you liked this article, there are a few other things you might like! For more rants check out my Instagram, the AJ&Smart YouTube and my Podcast with Jake Knapp. Come say hey! To see the behind-the-scenes of running AJ&Smart, check out our Instagram and to learn more about AJ&Smart you can find us here. Also thanks to @ImolaUnger for helping us document our Sprint 2.0!